Other photos: Photo 1, Photo 2, Photo 3, Photo 4, Manufacturer Provided Image: 731, Manufacturer Provided Image: Above, Manufacturer Provided Image: Above, Manufacturer Provided Image: Dining, Manufacturer Provided Image: Interior, Manufacturer Provided Image: Saloon, Manufacturer Provided Image: Helm, Manufacturer Provided Image: Galley, Manufacturer Provided Image: Head, Manufacturer Provided Image: Head, Manufacturer Provided Image: Double Cabin, Manufacturer Provided Image: Twin Cabin. 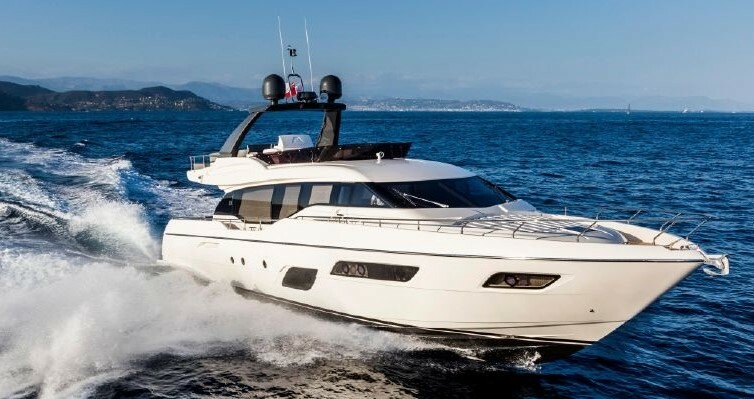 Ferretti 731 - 4 cabin yacht with crew cabin for 2 persons, boat after extensive refit of exterior and interior done in 2017. Yacht is offered by 2nd owner, use always private.Yacht is fully equipped including stabilization - gyro Mitsubishi, full navigation system, radar, sat tv antenna, sat phone, watermaker, hydraulic platform, teak on all decks. Engine hours 1400h. SYS Yacht Sales is pleased to assist you in the purchase of this vessel. This boat is centrally listed by RS Yachts.